Where Does the Dalā’il al-Khayrāt Begin? The text also includes a fuly vowelled edition of the Dalail (transmission of Sayyid Ibrahim al-Khalifah al-Ahsai) and some chains of narration for the text back to the author. 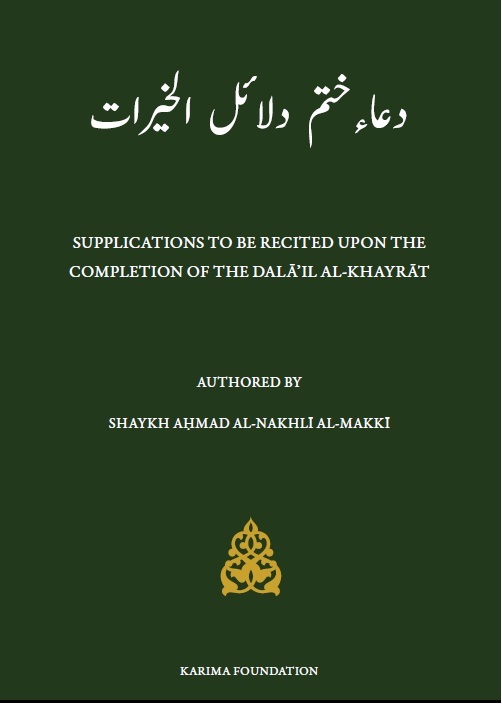 The second booklet we prepared is the Dua for the Khatm of the Dalail authored by Shaykh Ahmad al-Nakhli al-Makki, who was from the teachers of the teachers of Shah Waliullah al-Dihlawi. His dua is present in a number of the Indo-Pak editions of the Dalail (perhaps being brought back to the Indian Subcontinent by Shah Waliullah ?) but seems to be less popular in the Middle East. On a recent visit to Makka al-Mukarrama one of the scholars there asked for a copy of this dua after he saw it. He mentioned to me that he was unaware of Shaykh al-Nakhli having authored such a dua. Next up inshAllah is to publish the beginners Hanafi fiqh manual Tuhfat al-Mubtadi which we have been working on sporadically since November 2006, may Allah Taala facilitate its completion through His Generosity and Grace. Where can I get a hold of the works mentioned in this article? Is it possible to get copies of these? Where can I get these blessed books? i love dalail ul khairat. this comment is so simple. but to me this love is more credible than any thing in this world. its ocean for me. its mountains for me. its a deep sea for me. its just everything for me. its my life. it has become my life. i pray may i never think of living without this wird and salawat. Is it possible to get copies of the two books on the Dala’il al-khayrat? If so, what needs to be done?